HISTORY was made in Lissara, Presbyterian Church, Crossgar, on Sunday night when two women elders were installed for the first time. They were among six new elders installed by the Commission of the Presbytery-of Down. The new Moderator of Presbytery, Rev. Paul Erskine from 2nd Comber conducted the worship. Dr. Desmond Bailie, Senior Minister of Kilmore, outlined the scriptural warrant for the Office of eldership while Rev. Tom Craig, Ardglass and Strangford read the Scripture. 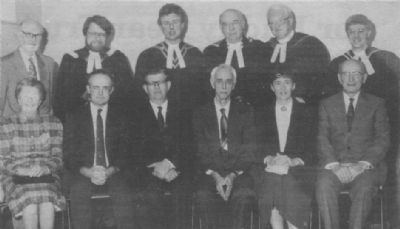 At a reception afterwards in the Church Hall, Rev Uel Armstrong and the Clerk of Session, Mr Tom Hewitt, welcomed into the Eldership, Miss Thora Kennedy, Mrs Elizabeth Patterson. Mr Robert McClurg, Mr Jack McMillan and Mr Ross Moffett who were ordained and installed. Mr Sam Hilditch, a former elder in Ardglass was also installed. Next Sunday, March 22, the Morning Worship will be led by the church elders and the AGM of the church will be held at the evening service at 7 pm. Reproduced from an article in Mourne Observer - Wednesday 18 March 1992.